Go to Dagorald town. It's in the middle of the swamps. 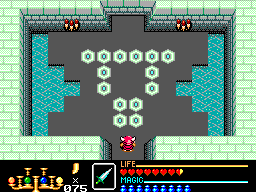 Save your game then keep going east until you reach the 5th labyrinth (see picture). 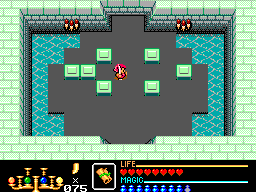 The 5th labyrinth is relatively small compared to the others but don't let its size fool you! 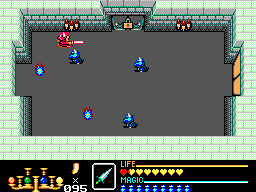 The entire dungeon is fraught with tough-to-beat monsters and can be quite hard if you're still unfamiliar with the game. 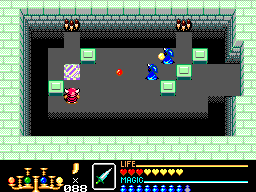 In the following room, there are only ordinary demons and blue bats, they're easy to handle. 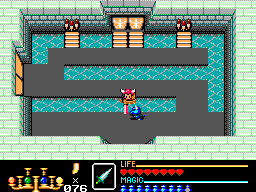 Kill all monsters to get a key, then use Earth Magic to break the brick on the right as shown in the picture. The shut door will open. Here things can get a little out of hand. The space is too narrow, which means evading monsters will be tough. Luckily, you can cross the water with the Canoe, use this to your advantage. Kill the bats first as they're annoying. Next, place yourself where the demons can't reach you but can be hit by your sword. Push the right torch to open the doors. Enter the top door and go directly to the locked door. Killing skeletons is not needed. Get the Speed Shoe inside the chest and watch out for the springing spikes. 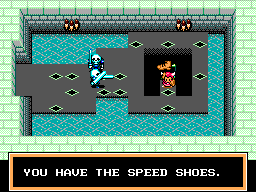 The Speed Shoe will increase your character's speed over all grounds. Go all the way back and enter now the left door. Watch out for the statues and ghosts in the room. Go up and push the right torch to open the shut door. Kill the monsters only if needed. 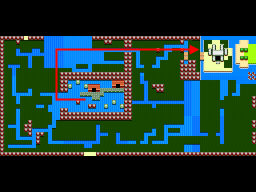 In the left room, again push the torch (this is so repeatitive) and a small bridge will appear on the other side. Go back to the room with the statues and enter the left door this time. 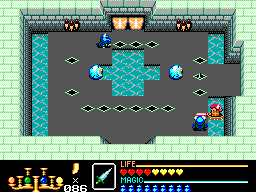 Here again, use the water to escape from the blue demons and after you kill them it's best to switch to your old Battle Axe to deal with the eyeballs. Stand in a diagonal tile to theirs and keep hitting them. Enter the top door after. With the bridge up you can now proceed to the left door. Destroy the brick as shown in the picture and walk into the warp. 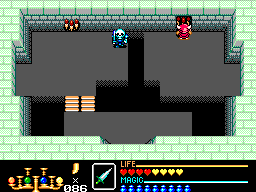 You'll be teleported to a room with blue demons. 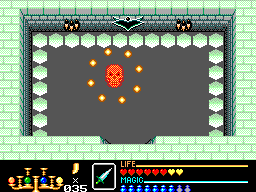 Kill them or make a run to the left torch, you need to push it to open the shut door in the next room. The rest is pretty easy, just follow the way to the last room. Open the locked door and get ready for the big boss. 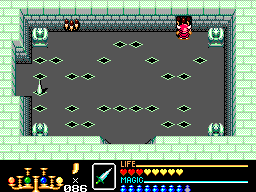 This boss is relatively easy. Just stay at the door and attack the spheres floating around him. You can use the Thunder Magic to get him if he moves too much. Once his spheres are destroyed take 2 steps up and keep attacking. His head won't reach you if you're two or less steps from the door. 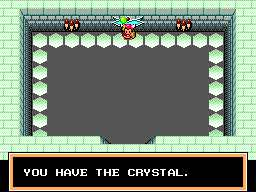 Once you destroy the boss, collect the lime crystal and it's over. 5 more to go!